Don’t you mean Dec 32nd? That’s when the others do it. Are you talking about people who have been convicted in court or people who have only been named by gossipers? People who have been convicted in court certainly should seek to keep a distance and we should seek them to be at a distance as they are a menace (rodef) to society. If they subsequently are exonerated, then each case is different and we can’t generalise. In terms if rumours, they need to be reported. It should be done very quietly if not public knowledge, but must be investigated as a sofek rodef. Of course in the same way that we look out for the abused and strongly encourage them to come out (even anonymously to a royal commission) we must also be careful not to destroy someone and their family over incorrect attribution. My record on these issues is abundantly clear despite some in Tzedek or supporters thereof attempting to openly lie and somehow paint me as a protector of low lives. Nothing could be further than the truth, and its not only on the record, I have demonstrable action to back up my stance in such things. It pains me greatly when those who are abused seem to think that anyone who seeks for ultimate EMES to prevail becomes some quasi enemy. You simply cannot go off shooting indiscriminately but you do need to alert the relevant authorities and provide warmth and friendship and support to those who have, or have claimed to have suffered. I simply cannot accept or understand Rav Druckman. He isn’t Charedi and is a lover of the land and people. He’s list ME however. “In terms if rumours, they need to be reported.” – who to? “but must be investigated as a sofek rodef.” – by who? 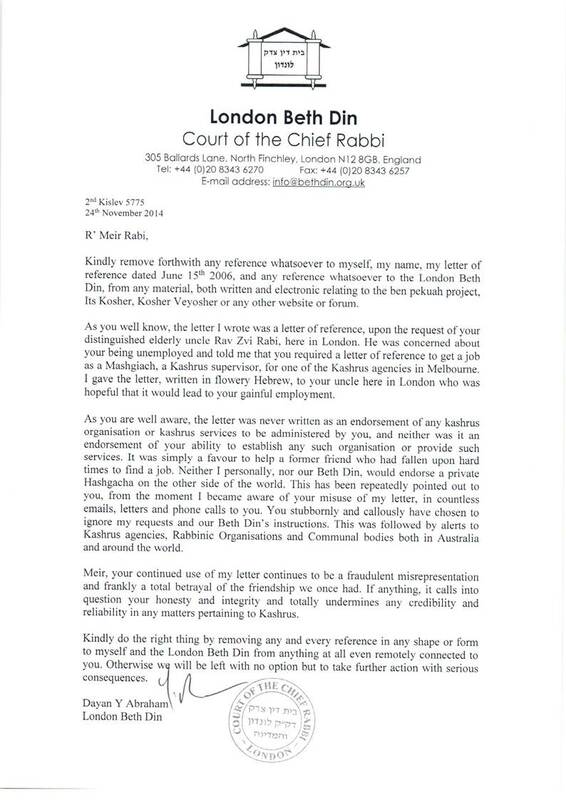 The Rabbonim that sent Leifer overseas? Yeah, right. Reported to authorities of course. I don’t know what happened with the Laufer case for example but that was more than rumours and was allegedly known as such for months. Talking of losing faith, I haven’t seen anything written about the Supreme Court judgement of the Gutnick vs Tashi case. Where is the outrage? Maybe because everyone benefits from Yossel’s largesse. I read it and saw two businessmen slug it out in court. One was clearly not considered a reliable witness by the judge, and was castigated for his actions. I don’t think that shocked me anywhere near as much the Rav Druckman issue. If anything, it will mean people will be more careful when they do business. I was also shocked by the ability of so called anonymous people to besmirch the Maccabi President and to tar him without so much as any evidence whatsoever. We need to treat these anonymous informants as beneath contempt. Unless THEY have been victims, why the HECK are they anonymous? Then I read the sanctimonious advice from Tzedek about how Shules should “police” their services. Who set them up as the experts on such matters let alone the people who should be advising Shules about how to deal with those who don’t sit with their parents? I sit on the board of a Shule, and I know what we do, and I know what we have done as soon as we heard of such things. We aren’t idiots. Previous Previous post: Why the sudden fuss about “it’s kosher”?